Hello, my name is Shannon and I'm counting down to my 40th birthday by performing 40 random acts of kindness. Learn more about how the Kindness Countdown began and my family here. The kids and I had such a great time with our latest random act of kindness! We took a trip to Target to purchase some colorful plastic eggs and then searched the store for the best prizes to put inside. Our first thought was to fill them with sweets since candy eggs are our favorites to find on egg hunts...but we didn't want critters in our town to run off with our treats, not to mention we didn't want to exclude the growing number of people with food allergies. We were thrilled when we happened upon these little animals and knew right away they would be perfect! 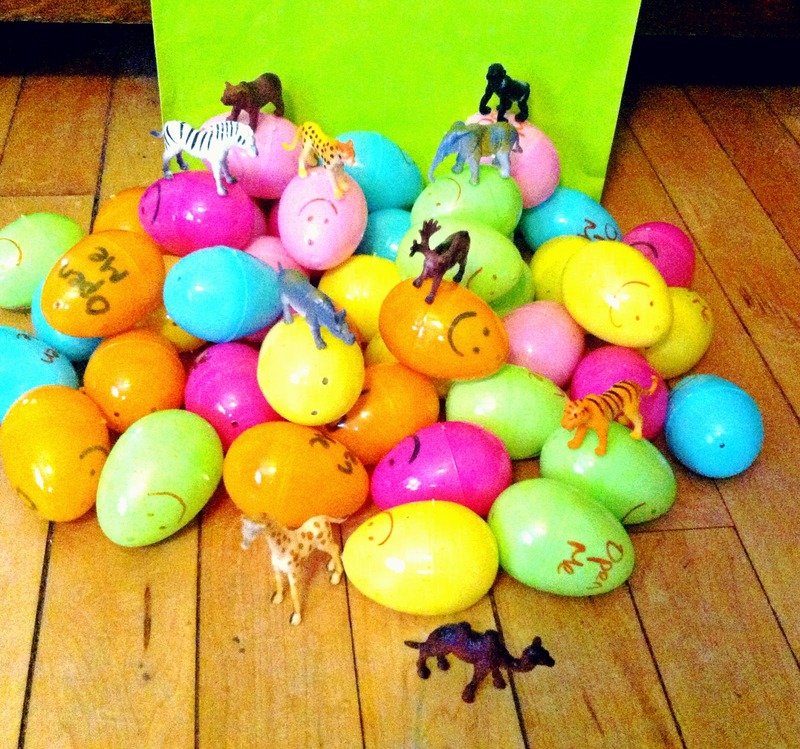 Once home, we filled each of our 40 eggs with either an ape, elephant, bear, zebra, rhinoceros, tiger, cheetah, giraffe, moose or camel. 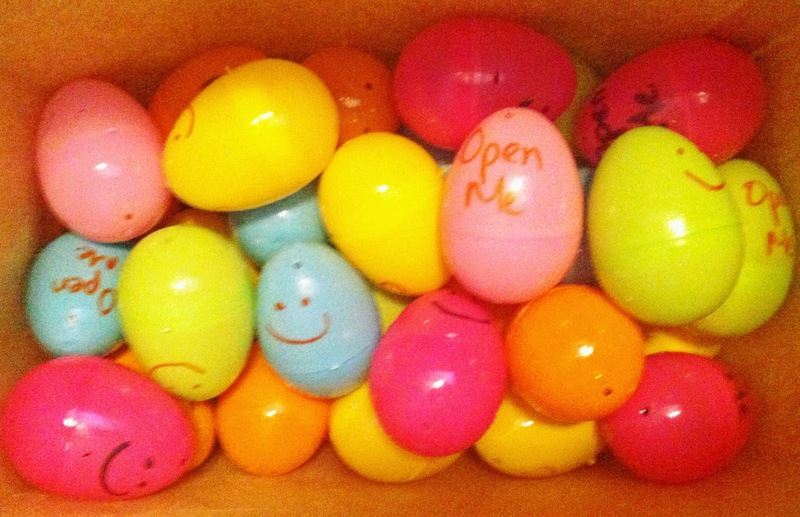 I wrote "Open Me" on each egg while my children drew smiley faces on the other side. And then the real fun began! We visited the two largest parks in our town and hid eggs on the playgrounds, near the picnic tables, on bridges and even inside trees! 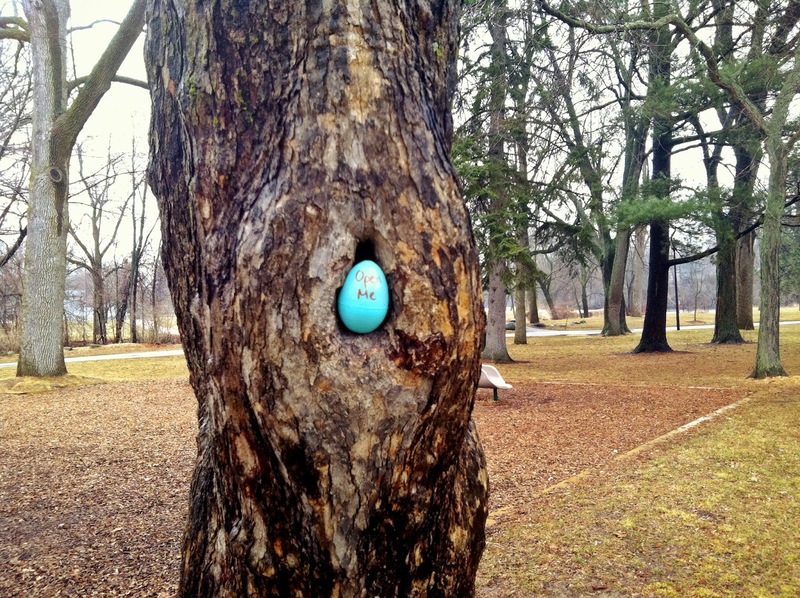 We also placed a dozen eggs outside of our library and near the coffee shops and bakeries in town. The next day we drove to all of the places and marveled at the missing eggs...only 3 remained. I hope the children (and adults) had fun on their unexpected egg hunt! Welcome to the Kindness Countdown!